The concern of the 27 May 1778 congressional reorganization to reduce expenses and adjust quotas to a realistic level became more acute in succeeding years. As British operations shifted emphasis to Virginia and states farther south, Washington and Congress transferred large elements of the Main Army to the Southern Department. By October 1780, when the three-year enlistments of 1777 were about to expire, the need to realign the existing military organization became intense. The major reorganization that resulted attempted to deal realistically with the limitations while still extracting maximum utility from the available resources. In January 1780 the Continental Army actually contained approximately that number of officers and men.2 The Southern Department included all the troops from Georgia and the Carolinas, the three provisional Virginia regiments, two regiments of dragoons, and Pulaski's legion. The equivalent of a brigade of continentals served in the Eastern Department, while the Northern and Western Departments each had two regiments. Sixteen brigades plus supporting troops, the heart of the Continental Army's fighting strength, remained either with the Main Army or in the Highlands Department. Excluding the New Hampshire Brigade at Danbury, Connecticut, the fifteen brigades in New Jersey and the Highlands included an Infantry contingent of 168 field, 1,209 company, and 273 staff officers; 1,650 sergeants; 1,579 drummers and fifers; and 14,673 rank and file. The Artillery had 180 officers and 1,190 enlisted men; the Cavalry, another 64 officers and 672 men. The brigades were short 331 officers, 315 sergeants, 242 drummers and fifers, and 13,353 rank and file. In the spring of 1780 Washington began to consider an attack on New York City if he could obtain the assistance of a French expeditionary force under Lt. Gen. Jean, Comte de Rochambeau. Efforts began to increase the effective strength of the Main Army, but when Rochambeau's troops arrived at Newport, Rhode Island, too debilitated from the sea voyage for action that year, Washington reluctantly had to abandon his plans. In September the Main Army, the Highlands Department, the Northern Department, and the Eastern Department contained a dozen Continental brigades plus supporting units and a number of regiments in detached garrisons. The Continental Infantry now included 169 field, 1,091 company, and 261 staff officers; 1,381 sergeants; 774 drummers and fifers; and 17,232 rank and file. Artillerymen from three regiments totaled another 140 officers and 1,097 men, while the Cavalry contingent numbered somewhat more than 500 of all ranks. Militia reinforcements in New York and Rhode Island amounted to 181 officers and 3,192 men.3 There were acute shortages, particularly among ensigns, Artillery second lieutenants, and enlisted men. The Infantry force lacked 372 officers, 384 sergeants, 340 drummers and fifers, and 12,718 rank and file; the Artillery regiments, 77 officers and 652 men. Equally significant, over 200 Infantry officers were performing staff duties. 1. JCC, 15:1357-59, 1369, 1376-77, 1393-96; 16:36-38, 80-83, 110, 117-20, 123, 125-28, 146-51, 17880, 287; Fitzpatrick, Writings, 16:78-79; 17:172, 407-8, 431-36, 504-6; 18:202-4, 207-11; Burnett, Letters, 5:33, 92-93; Steuben Papers (undated 1780 memorandum). 2. RG 93, National Archives (Monthly Return, Main Army, January 1780); Lesser, Sinews, pp. 148-50, prints a variant of this return. 4. JCC, 15:1087, 1256, 1347; Burnett, Letters, 4:322-23, 419-20, 428-29; Fitzpatrick, Writings, 16:360, 382, 473; 17:124, 134-35, 151, 175, 206-8, 228, 236-38, 242-43, 309; Moultrie, Memoirs of the American Revolution, 2:67, 114. For the provisional Virginia regiments, see above, Chapter 6. 5. Kite, Duportail, pp. 172-75; Bernard A. Uhlendorf, ed., The Siege of Charleston (Ann Arbor: University of Michigan Press, 1938); Heinrichs, "Extracts From the Letter-Book," Pennsylvania Magazine of History and Biography, 22: 137-70. 7. Steuben Papers (Otho Williams to Steuben, 12 Oct 80; Mordecai Gist to Steuben, 12 Oct 80; Return, 1 Oct 80); Gates Papers (to Washington, 3 Sep 80; Return, 23 Sep 80). The defeat caused Maryland to abandon efforts to organize an eighth regiment, the "Regiment Extraordinary." 8. JCC, 16:75-79, 293-312, 332-33, 350-57, 362; 17:472, 522-23, 528, 579-80, 589-90, 604-5, 607-8, 719-20; 18:878-88, 1109-11; Fitzpatrick, Writings, 18:207-11, 356-58, 416-19, 425-32, 455-59; 19:2,7785,118,391-94; Burnett, Letters, 5:80, 89-92, 114, 126-78, 222, 343,372-74. 9. Fitzpatrick, Writings, 20:50; see also 19:402-13, 481-82. For an account of the logistical problems at this point, see Erna Risch, Supplying Washington's Army (Washington Government Printing Office, 1981). 10. JCC, 17:786; 18:839,844; Burnett, Letters, 5:378-79,389-90. A similar system had been proposed by the Board of war in February, but Congress had declined to act on it. JCC, 16:248-51. The final plan specified that on 1 January 1781 "the regular army of the United States" was to consist of 49 infantry regiments, Moses Hazen's special Canadian infantry regiment, 4 artillery regiments, 4 legionary corps, 2 partisan corps, and a regiment of artificers. Although not mentioned in the legislation, the Corps of Engineers, the companies of sappers and miners, the Marechaussee, and the Corps of Invalids remained unchanged. All other units had to disband and transfer their enlisted men to the line regiments. Congress allotted every regiment, except Hazen's and the two partisan corps, to a single state (Table 5) to simplify subsistence and troop replacement. At Washington's request, it gave the Army rather than the state governments the power to decide which officers were to retire. Seniority would be the determining factor in resolving disputes. 11. JCC, 18:893-97, 959-62; Burnett, Letters, 5:404, 407, 414-15 (Duane quotation), 417-18, 422-23, 428; Steuben Papers (to Washington 23 Oct 80); Fitzpatrick, Writings, 20:157-67, 263-64, 277-81, 311-12, 400. 12. JCC, 19:427-28; 20:711-12; RG 93 National Archives (Bd of War report, 28 Jun 81). lina and Georgia would have to be excluded since those states were occupied by the enemy. The plan would then provide for only 18,000 infantrymen. Washington said he needed 22,000: 18,000 for mobile field forces, 2,500 for garrisons in the Hudson Highlands, and 1,500 for service on the frontiers. 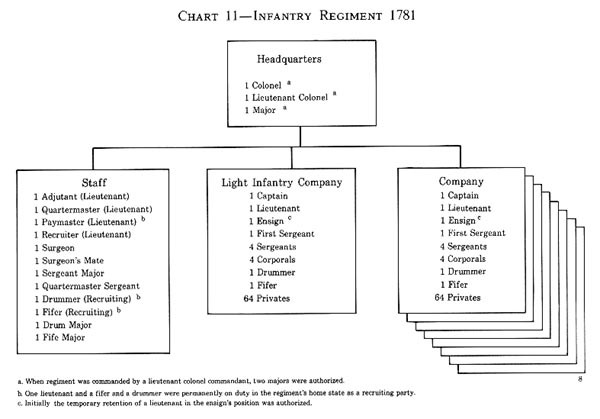 The congressional plan continued the basic regimental alignment of one light and eight line companies, all equal in size. It added three enlisted men to each company and left the number of officers unchanged. Washington, however, persuaded Congress to make substantial alterations. 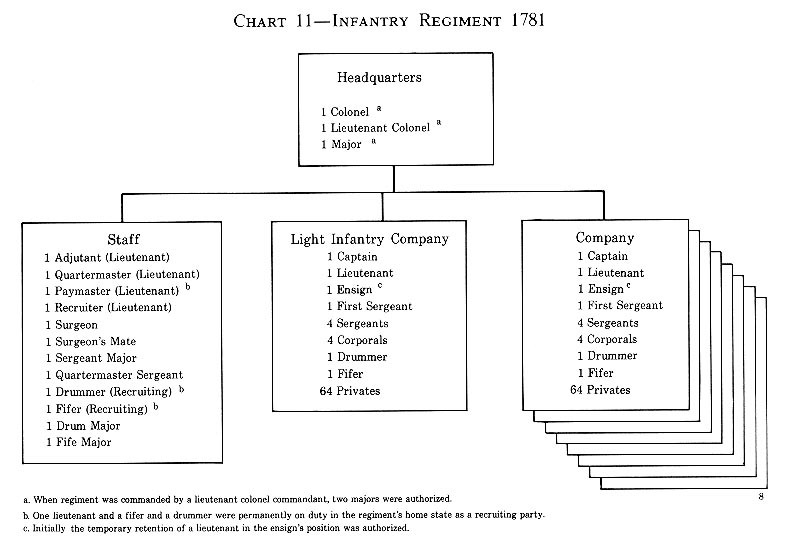 (Chart 11) Each regiment's three field officers�colonel, lieutenant colonel, and major, or lieutenant-colonel commandant and two majors�now no longer served as company commanders. This change enlarged the pool of field-grade officers for special assignments and significantly increased the number of captains within each regiment. Every company could expect to have three officers present in combat. Two additional sergeants, one for the first time officially designated the first sergeant, and another corporal joined each company. The number of privates in a regiment [i.e., company] increased from fifty-three to sixty-four. Four extra lieutenants joined the staff to fill the permanent positions of paymaster, adjutant, quartermaster, and recruiter. The regimental recruiter remained in his home state with a drummer and a fifer and worked full time to secure replacements. 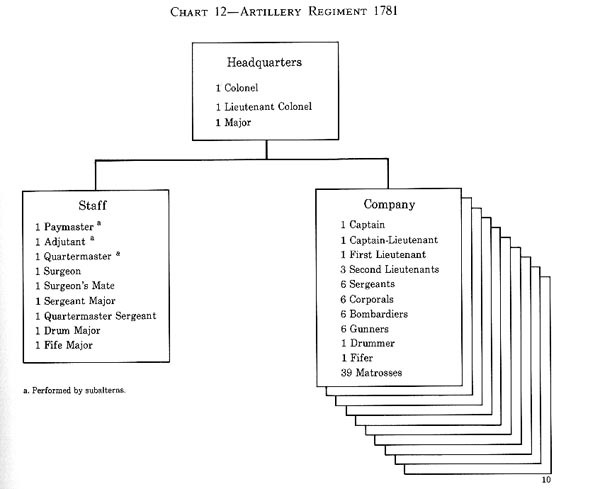 Extra lieutenants were available because of the reduced number of regiments; they also filled positions left vacant by the shortage of ensigns. 544 rank and file (120 percent of the 1778 figure), 40 sergeants, 24 company officers, and 3 field officers. Although the new regiment did not regain the power of the 1776 regimental arrangement, it was substantially better organized and more efficient than the typical British regiment. 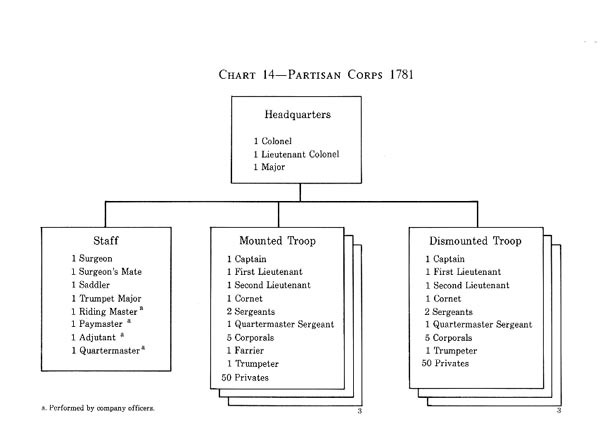 In the case of the four light dragoon regiments, Congress proposed only minor changes, adding five privates to each troop. Bearing in mind current forage problems and the success of experiments of the 2d and 4th regiments, Washington countered with a very different proposal. 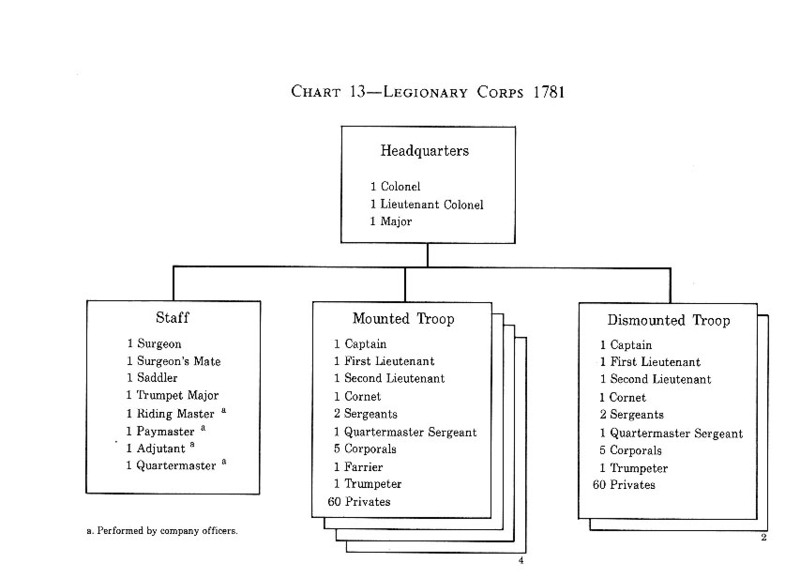 (Chart 13) Under his plan each regiment would dismount two troops, thus turning the regiment into a European-style legionary corps. "I prefer Legionary Corps," he told Congress, "because the kind of Service [reconnaissance duties] we have for horse almost constantly requires the aid of Infantry. "14 The infantry contingent gave each regiment the ability to defend its quarters. The savings from eliminating over one hundred horses plus specialized equipment per regiment also argued for the change. As in the case of the artillery regiments, these legionary corps were allocated to their original recruiting areas. 13. Fitzpatrick, Writings, 18:277-79, 311; 20:344-45; 21:45-46, 411; 22:45-48; Lamb Papers (Knox to Lamb, 8 Sep, 2 and 21 Nov 80; Robert Walker to Lamb, 31 Oct 80; Ebenezer Stevens to Lamb, 3 Nov 80). troops were dismounted. The latter variation made the corps more self-reliant, allowing it to operate at a greater distance from its army than a legionary corps. 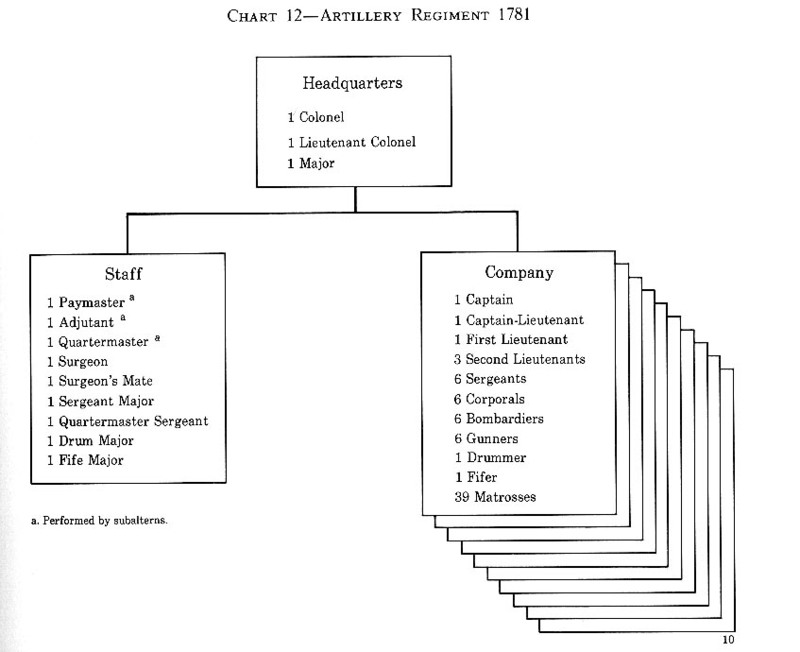 The final plan for the Continental Army in 1781 called for 61 regimental equivalents. States supporting the Southern Department furnished, on paper, 21 infantry regiments, 1 artillery regiment, 2 legionary corps, and 1 partisan corps. Washington expected the Main Army to have the services of 29 infantry regiments (including Hazen's oversized unit), 3 artillery regiments, 2 legionary corps, and 1 partisan corps, plus the companies of sappers and miners, the Marechaussee Corps, the Corps of Invalids, and his guard. The total of 61 also included the dispersed artificer regiment. The distribution of units reflected the different operations faced in each theater. Washington had more artillery, infantry, and specialist troops to attack the fortified base at New York. The Southern Army's larger cavalry force gave that army more mobility. 17. Fitzpatrick Writings, 21:12-13, 38-39, 82-83, 250-51. 18. Ibid., 20:410, 491; 21:40-41, 45, 69-70, 405.
the 2d immediately marched to the Wyoming Valley to assume garrison responsibilities in that region; New Jersey troops became neutral mediators in the Connecticut-Pennsylvania jurisdictional dispute.20 Both New York and New Jersey continued to field a brigade, although both brigades remained short a regiment. 20. Fitzpatrick, Writings, 21:29, 32-33, 37-38. 21. Stille, Anthony Wayne, pp. 248-63; William Henry Smith, ed., The St. C/air Papers, 2 vols. (Cincinnati: Robert Clarke & Co., 1882), 1:532-33; Burnett, Letters, 5:516-33, 540-41; Pennsylvania Archives, 2d ser., 11:631-74; 4th ser., 3:796-99. 22. Fitzpatrick, Writings, 21:124-25, 128-30, 135-37, 146-49; John Shreve, "Personal Narrative of the Services of Lieut. John Shreve of the New Jersey Line of the Continental Army," ed. S. H. Shreve, Magazine of American History 3 (1879):575. 24. William Seymour, A Journal of the Southern Expedition, 1780-1783 (Wilmington: Historical Society of Delaware, 1896), pp. 7-11; Kirkwood, Journal and Order Book, pp. 11-13; Caleb Prew Bennett, "Orderly Book of Caleb Prew Bennet at the Battle of Yorktown, 1781," ed. Charles W. Dickens, Delaware History 4 (1955):108-9, 113, 121, 139, 146. The 1781 campaign conclusively demonstrated that the Continental Army had matured into a small but effective military force despite pay and supply problems. Washington and Greene wrested the strategic initiative from the British, adjusting their plans to take advantage of changing circumstances. With French military, naval, and financial support, they caused a major defect in British dispositions and then exploited it to the maximum. 26. Fitzpatrick, Writings, 19:381-82; 20:465; 21:82; Jefferson, Papers, 4:17-18, 349-50, 603-4; 5:111-16, 162-63; 6:30-32; Palmer, Calendar of Virginia State Papers, 1:594-96; Gates Papers (Muhlenberg to Gates, 12 Oct 80; Abraham Buford to Gates, 21 Oct and 1 Nov 80; Ebenezer Stevens to Gates, 16 Nov 80; Return of Southern Army, 5 Nov 80); W. A. Irvine, ed., "Affairs at Fort Pitt in 1782," Historical Magazine, 1st ser. 7 (1863):306-9. 28. Lee, Memoirs of the War in the Southern Department, pp. 230-31; [Banastre] Tarleton, A History of the Campaigns of l 780 and 1781, in the Southern Provinces of North America (London: T. Cadell, 1787), pp. 214-22; Gates Papers (Morgan to Will[iam Clajon], 26 Jan 81). In a series of engagements and maneuvers Greene gradually drove Lt. Col. Francis Rawdon and Lt. Col. Alexander Stewart into coastal enclaves. On 8 September he attacked Stewart's camp at Eutaw Springs, South Carolina. Militia and irregulars led the attack, with the Continentals in reserve. The high number of relatively untrained recruits forced Greene to deploy into line too soon and the attack lost some of its momentum. When terrain and stiffening resistance slowed his advance, Greene committed his reserve in "a brisk charge with trailed Arms, through a heavy cannonade, and a shower of Musket Balls. "31 This maneuver routed the main British body. Broken terrain and casualties among key American officers, however, had disrupted many units, and Stewart was able to rally some of his men. Rather than risk defeat, Greene withdrew. Eutaw Springs left the British incapable of further offensive action in the south. Cornwallis' gamble that his subordinates could hold the Carolinas and Georgia had failed. 30. Tarleton, Campaigns, pp. 271-79; Charles O'Hara, "Letters of Charles O'Hara to the Duke of Grafton," ed. George C. Rogers, South Carolina Historical Magazine 65 (1964):159-66, 173-79. 31. RG 360, National Archives (Greene to Congress, 11 Sep 81). cruit.33 Cornwallis ended the summer by selecting Yorktown as the site for a permanent naval base. 33. John Davis, "Diary of Capt. John Davis, of the Pennsylvania Line," ed. Joseph A. Waddell, Virginia Magazine of History and Biography 1 (1893):5-7; Joseph M. Beatty, ed., "Letters From Continental Officers to Doctor Reading Beatty, 1781-1788," Pennsylvania Magazine of History and Biography 54 (1930): 159-61; Fitzpatrick, Writings, 21:254-56, 273-74, 421-24. 34. RG 93, National Archives (General Return, Main Army, June 1781). Lesser, Sinews, pp. 204-5, prints a variant of this return. ficers and 3,426 men. Rochambeau commanded the Left Wing, consisting of his own corps and some 3,000 troops from the West Indies under Lt. Gen. Claude Anne, Marquis de Saint-Simon Maublerce.37 The siege itself progressed rapidly and in accord with formal European procedures. Artillery fire crushed Cornwallis' defenses, and on 19 October his troops marched out of their works and laid down their arms. 37. Fitzpatrick, Writings, 23:134-35, 146-47; RG 93, National Archives (Weekly Return, Main Army, 3 Oct 81). 38. Fitzpatrick, Writings, 23:193-95, 198, 200, 216-17, 248-50, 258, 266-67, 270, 292-99, 309-13, 317-18; RG 360, National Archives (Greene to congress, 23 Jan 82); Steuben Papers (Abstract of Musters for the Southern Army, 1 Apr-19 Sep 82); William Nine, "Extracts From the Papers of General William Irvine," ed. W. A. Irvine, Pennsylvania Magazine of History and Biography 5 (1881):268, 274-7s; Archives of Maryland, 18:429-75; Palmer, Calendar of Virginia State Papers, 2:127, 241, 582-85; Kirkwood, Journal and Order Book, pp. 27-30; Tuffin Charles Armand, Marquis de la Rouerie, "Letters of Col. Armand," New-York Historical Society Collections for 1878, pp. 323-30. 39. Fitzpatrick, Writings, 23:290-91, 293-94, 323-24, 374, 25:110-11; James Thacher, Military Journal of the American Revolution, From the Commencement to the Disbanding of the American Army (Hartford: Hurlbut, Williams & Co., 1862), pp. 302-3. During the last two years of the Revolution, the Continental Army did not engage in any major battle. Lack of French naval support prevented assaults on the remaining British strongholds, and changed political conditions in England made it clear that a negotiated peace would come in time. Congress and the American people, weary of a long war, increased the pressure on the military establishment to reduce expenses. Washington's role in gradually dismantling the Continental Army became one of his most important contributions to the new nation. 42. JCC, 21:791, 1127, 1179-81, 1163-65, 1182-83; 22:211-12, 381-82; Burnett, Letters, 6:270-80; Fitzpatrick, Writings, 23:29-32, 452-56, 498-99; 24:391-92. The final return (27 April 1784) of officers forced to retire by this "reform" is in Record Group 360, National Archives. is no news of Peace as yet. But the armies are all well diciplined [sic] and in wonderful good spirits and draw very good provisions. "44 By the Continental Army's standards conditions were good. Yorktown had raised morale, and the Highlands area offered long-established depots and housing as well as training programs. The Army included a high proportion of hardened veterans who knew how to make the most of their circumstances. 44. Sylvia J. Sherman, led., Dubros Times: Selected Depositions of Maine Revolutionary War Veterans (Augusta: Maine State Archives, 1975), p. 9. Also see Fitzpatrick, Writings, 24:101. 46. Ibid., 24:303,309-10, 334, 358-59,459-60; 25:93-96,121. 49. RG 93, National Archives (Monthly Return, Main Army, August 1782); Lesser, Sinews, pp. 232-33, prints a variant of this return. 50. Fitzpatrick, Writings, 24:352-55; 25:286-87, 312-13, 376, 425-26, 439-40, 456, 460-61; 26:3-4, 22, 140-42, 172; JCC, 22:451-53; 23:710-11, 736-39, 837; Burnett, Letters, 6:431-32, 537-38; 7:1-2, 11-13. 52. JCC, 24 275-76; Fitzpatrick, Writings, 26:98, 101, 206; J. D. Eggleston, Officers of the Virginia Line at Winchester, 1783,', William and Mary Quarterly, 2d ser. 7 (1927):61; Katherine Glass Greene, Winchester. Virginia, and Its Beginnings, 1743-1814 (Strasburg: Shenandoah Publishing House, 1926), pp. 24144; Archives of Maryland, 18:477, see, 596-97; Southern Department Orderly Rook (Greene's General Orders for 2 and 3 Nov 82); Palmer, Calendar of Virginia State Papers, 2:335. 53. Burnett, Letters, 6:537-38; Allen D. Candler, Revolutionary Records, 3:57, 79-80, 157, 161-63; RG 360, National Archives (Wayne to Greene, 12 Jul 82; Greene to Congress, 13 Aug 82); Steuben Papers ("Abstract of Musters for the Southern Army," 1 Apr-19 Sep 82; Francis Mentges to Steuben, 9 Jan and 2 Apr 83). 55. Fitzpatrick, Writings, 25:430-31; Charles Thomson, "The Papers of Charles Thomson, Secretary to the Continental Congress," New-York Historical Society Collections for 1878, pp. 70-80; Burnett, Letters, 6:405-9, 514, 528, 553; 7:13-15, 29-31, 72-74; JCC, 22:424-25; 24:93-95, 145-51, 154-56, 178-79; Hamilton, Papers, 3:290-93; Joseph Jones, Letters of Joseph Jones of Virginia, ed. Worthington C. Ford (Washington: Department of State, 1889), pp. 97-103. 56. Jones, Letters, pp. 97-103. Also see Hamilton, Papers, 3:253-55. 57. Burnett, Letters, 7:27-28; Fitzpatrick, Writings, 26:185-88; Gates Papers (George Mesam to John Armstrong, 14 Sep 80 [copy]; William Clajon to Gates, 1 Mar and [11-14] Apt 81 and 10 Mar and 13 Apr 82). Clajon fed Gates poisonous comments on Washington ("George IV") and on Washington's supporters ("the Sanhedrin"). 58. Gates Papers (Armstrong to Gates, 22 and 29 Apr 83). 60. Fitzpatrick, Writings, 26:221-22, 263-64, 268-69, 285-93, 334-36; JCC, 24:207-10, 238-52; Burnett, Letters, 7:88-90, 93, 106-8, 110-11, 246-48, 378-88; Hamilton, Papers, 3:317-21; Christopher Collier, Connecticut in the Continental Congress (Chester, Conn.: Pequot Press, 1973), pp. 63-67. 61. Fitzpatrick, Writings, 26:330-33, 350-52, 441-43; Burnett, Letters, 7:161-62, 24:253-54, 269-71, 275-76, 358-61, 364-65, 390, 496; 25:963, 966-67. 62. Fitzpatrick, Writings, 26:448, 464-65, 471-75; 27:6-7, 10, 15, 19-20, 25-26, 32-34, 38-39; JCC, 24: 403; 2d Continental Artillery Regiment Orderly Book (Regimental Orders, 10 and 11 Jun 83), New-York Historical Society; 3d Continental Artillery Regiment Orderly Book (Regimental Orders, 8, 9, and 11 Jun 83), New-York Historical Society. cials of the colonial period were insufficient for a long war. Those ideological arguments resurfaced, however, during the long debate over the legality of any permanent army in peacetime. These discussions in 1783 and 1784 would color the development of the United States Army for the remainder of the century. Congress issued a proclamation on 18 October 1783 which approved Washington's reductions. On 2 November Washington then released his Farewell Order to the Philadelphia newspapers for nationwide distribution to the furloughed men. In the message he thanked the officers and men for their assistance and reminded them that the singular interpositions of Providence in our feeble condition were such, as could scarcely escape the attention of the most unobserving; while the unparalleled perseverance of the Armies of the U[nited] States, through almost every possible suffering and discouragement for the space of eight long years, was little short of a standing miracle.66 64. Hamilton, Papers, 3:317-22; Burnett, Letters, 7:150; Fitzpatrick, Writings, 26:315-16, 355, 374-98, 479, 483-96; Kite, Duportail, pp. 263-70; Steuben Papers (undated 1783 memorandum). Other officers submitting opinions to Washington include Armand, Heath, Knox, Jean Baptiste Obrey de Gouvion, Rufus Putnam, Ebenezer Huntington, and Governor George Clinton. 65. Fitzpatrick, Writings, 26:368-69, 399-400, 480; 27:16-18, 61-63, 120-21, 221, 255-59, 278-79; JCC, 24:337; Magazine of American History 9 (1883):254-55; Bauman Papers (to George Clinton, 22 Aug 83). 67. JCC, 25:702-5; Fitzpatrick, Writings, 27:167-69, 197-98, 205-8, 213, 222-30. Washington hoped the veterans would settle around the frontier posts and be a buffer between the Indians and other frontiersmen. 70. JCC, 24:337, 492-94, 501n; 25:548-49, 722-45; 26:54-55, 201-7; 27:432-37, 486-88, 499-502, 51224, 530-31, Burnett, Letters, 7:166-69 189-91, 540-43, 546-47, 550-53, 572-73, 587-88, 604-5; Hamilton, Papers, 3:211, 378-97; Fitzpatrick Writings, 27:140-44, 202-4; "Thomson Papers,'' pp. 177-79. 71. The regiment s infantry contingent is perpetuated by the 3d Infantry, a parent regiment under the Combat Arms Regimental System, with active battalions in the Regular Army and Army Reserve; the artillery, by the 1st Battalion, 5th Field Artillery. 72. Lyle D. Brundage, "The Organization, Administration, and Training of the United States Ordinary and Volunteer Militia, 1792-1861" (Ph.D. diss., University of Michigan, 1959), pp. 340-93; Jeffrey Kimhall, "The Battle of Chippewa: Infantry Tactics in the war of 1812," Military Affairs 31 (1967):169-86. 73. Marquis de Chastellux, Travels in North-America, in the Years 1780, 1781, and 1782, 2 vols. (London: G. G. J. and J. Robinson, 1787), 1:19. Also see Orville Theodore Murphy, Jr., "French contemporary Opinion of the American Revolutionary Army" (Ph.D. diss., University of Minnesota, 1957). It is true that the militia played a very important role in the War of American Independence. Its political functions probably were indispensable, and as a military institution, supported by state troops, it continued to meets its traditional colonial responsibilities for local defense and for providing a general emergency reserve. On the other hand, it could not effectively operate as a main battle force at any distance from home or for an extended period. Congress recognized the militia's limitations from the beginning of the war and turned to full-time regular troops, the Continentals. As long as a field army of Continentals remained nearby, a British commander had to concentrate on it and leave the militia unmolested. 75. For examples of some of the most recent interpretations of the Revolution, see Stanley J. Underdal, ea., Military History of the 'American Revolution: The Proceedings of the 6th Military History Symposium, United States Air Force Academy, 10-11 October 1974 (Washington: Office of Air Force History, 1976), and Don Higginbotham, ea., Reconsiderations on the Revolutionary War: Selected Essays (Westport: Greenwood Press, 1978). tween garrison, general support, and direct support assignments maintained training and ensured that every company could perform any mission in an emergency. Once the Army overcame early procurement problems, Knox also tailored the armament of each company to its specific task. The mounted arm never had the opportunity to develop into a battlefield force, although Lt. Col. William Washington's troopers gave a fine account of themselves in the later phases of southern operations. On the other hand, it did perform well in its original mission of reconnaissance. Theoretical development and practical necessity combined to produce the 1781 legion, an excellent configuration for carrying out this role in the prevailing conditions. The partisan corps, a European concept, developed into an excellent independent, long-range force that could stiffen local irregulars. A well-rounded group of support troops backed the combat units. Unlike the British Army, the Continental Army had specialized units to perform ordnance, maintenance, quartermaster, and military police functions. Highly trained engineers, both officers and units, functioned well in offensive and defensive assignments after 1777. 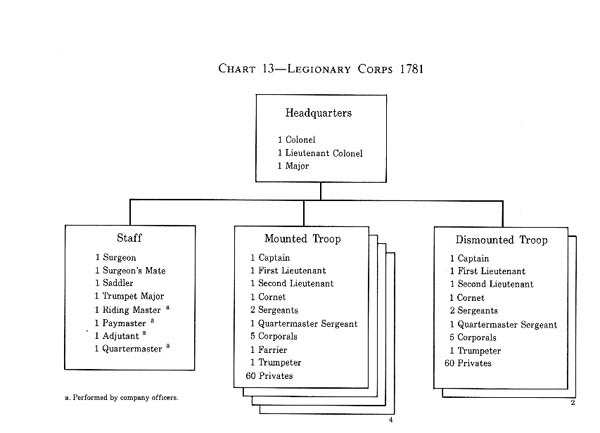 Combat and support units, presided over by a competent general staff, functioned by 1782 as a team equal in quality to that of any European army of the day. Tradition in the United States depicts the Continental Army as a hardy group of yeoman farmers and middle-class tradesmen under amateur officers who defeated a European army of lower class troops commanded by aristocrats. Recent studies indicate that after 1776 the Continental Army did not fit this image. The long-term Continentals tended to come from the poorer, rootless elements of American society to whom the Army, despite its problems, offered greater opportunity than did civilian life. Enlisted men were young (over half were under twenty-two when they enlisted) and mostly common laborers so poor as to be virtually tax-exempt. A sizable minority were hired substitutes or not native to the place where they had enlisted. Jersey, a single family, reinforced by cousins, in-laws, political allies, or business associates, could dominate entire regiments. In a force of this nature discipline posed a problem. Desertion rates were high, although few went over to the British. Washington coped by developing, in conjunction with his judge advocates, a system that adapted British military justice to the conditions of American society in the 1770's. His approach was mild by contemporary standards and extremely sophisticated. Washington did execute a few for particularly serious crimes. He preferred, however, to produce the same psychological effect on the Army by using last-second reprieves. Washington led the Continental Army to victory in the longest war in American history before Vietnam, overcoming physical and psychological obstacles which at times appeared insurmountable. The fact that Washington not only held the Army together but also molded it into a tough professional fighting force is a tribute to his inspirational leadership and judgment. That he then disbanded this force without incident when economic considerations forced him to do so was to accomplish the nearly unthinkable in the view of his contemporaries.